Should we fear Corbyn’s euroscepticism or is it exactly what EU-based UK emigrants need? Flickr/ EU Exposed. Some rights reserved.2015 has been an anxious year for EU-based UK emigrants: especially those of us on the left. Long used to viewing calls for a Brexit as right-wing policy (or posturing), left-wing voters have mixed feelings about the Labour leadership election of Eurosceptic Jeremy Corbyn. On the one hand, there is the potential rejuvenation of a party that, prior to the election, had appeared to be losing both direction and support. On the other hand, none of us want Britain to leave the EU, especially as UK emigrants are uniquely placed to see how EU membership benefits our adopted countries. But are we right to worry about Corbyn’s attitude to the EU? Or could a Eurosceptic Labour leader actually be exactly what EU-based UK emigrants need? The idea that Britain may leave the EU isn’t a new one to UK emigrants but we have been protected from the extent of the general public’s Euroscepticism. 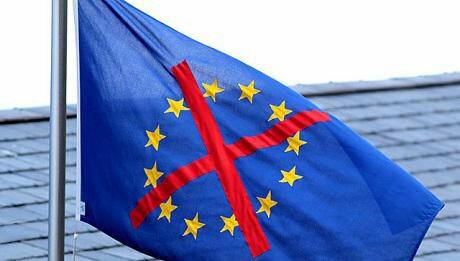 Opposition to Britain's EU membership has oscillated between 30% and 55% of voters since 2010 with the largest poll in 2014 showing 41% against, 41% for, and 18% undecided. Among UK emigrants, opposition to EU membership is— understandably— much lower. (Although support for a Brexit would probably rise if there was confirmation that it would not impact UK emigrant lives and jobs.) Being an economic immigrant makes it very easy to shut down anti-EU, anti-immigration talk within our UK communities. Even the most committed Eurosceptic struggles to complain about Polish and Hungarian workers when their own child, sibling or friend has become an EU economic immigrant. Unfortunately this doesn’t actually change anyone’s attitude to the EU, just the way they choose to express themselves and many UK emigrants were surprised by the popularity of anti-EU rhetoric during the May 2015 election. This slight removal from other UK voters has allowed UK emigrants to dismiss Euroscepticism as a right-wing, fringe movement or, at its most powerful, as a favoured Tory negotiation tactic. There was idle speculation about what might happen if Britain did leave the EU; would we all need to get visas? Would there be incentives to adopt EU citizenship? But, for the most part, planning for a Brexit was up there with planning for a zombie attack: only the most paranoid were taking it seriously. The perception of Euroscepticism as a right-wing vote winner held true throughout the 2015 election: UKIP clamoured for a full EU exit while the Tories proposed a referendum and David Cameron declared that he refused to lead a government that wasn’t committed to EU-reform. Left-wing voters across the EU were; however, disappointed to see the Lib Dems, Greens and Labour all promise to host referendums. The wording may have been slightly less nationalistic but the message was the same: no UK party was willing to fully back Britain's membership of the EU and to do so would have been a political non-starter. Then Corbynmania started, and the potential for Labour to robustly support a Brexit became a tangible possibility. Corbyn has long history of going against his own party’s pragmatic approach to the EU; he voted against the Maastricht and Lisbon treaties, and frequently expresses concerns about the Eurozone’s crisis management strategy. While it would be impossible to describe Corbyn as “anti-Europe” there was enough voter confusion in July 2015 for pro-EU Labour MPs to ask Corbyn to clarify his stance on EU membership. Corbyn’s response was that the Labour party will continue to work with the party’s European allies “to fight for a better Europe” but in his party conference speech last week, Corbyn made no mention of the EU. So what’s the plan? It is Corbyn’s potential to connect with alternative political parties and activists that should interest UK emigrants. Many of the concerns surrounding Corbyn’s Euroscepticism have focused on a perceived betrayal of pro-EU voters by the left-wing and the restrictions a Brexit may place on UK emigrants. When we look at the political and social issues in our adopted countries; however, it quickly becomes clear that whole-hearted support of the EU is not the only way British politicians can support UK emigrants. Especially in connection with two on-going issues that UK politicians across the political spectrum have failed to support or protect UK citizens over: austerity and TTIP. Right-wing UK politicians have tended to fixate on the potential for the EU to support Britain's economic agenda. Cameron has campaigned for TTIP to be pushed through with minimum resistance and, until Corbyn, all the major political parties supported austerity measures throughout the EU. But if TTIP goes ahead every single country in the EU will be affected. A bi-lateral trade agreement that is currently being secretly negotiated between the US and the EU: TTIP will increase the power of corporations to undermine things like banking legislation, environmental sanctions, food safety laws, allow for the marketization of healthcare and reduce the power of individual governments. Meanwhile, UK emigrants in Greece, Spain, and Portugal are witnessing the toll austerity measures can take on a country’s infrastructure and quality of life. Corbyn’s anti-austerity agenda and his ongoing opposition to TTIP can help Labour to form alliances within the EU and offer genuine help to campaigners on both issues. This could be an opportunity for UK emigrants to not only improve the conditions within our adopted countries, but also to feel a real connection to UK politics again.